Since it’s tree pruning time, here’s an idea for all those branches! 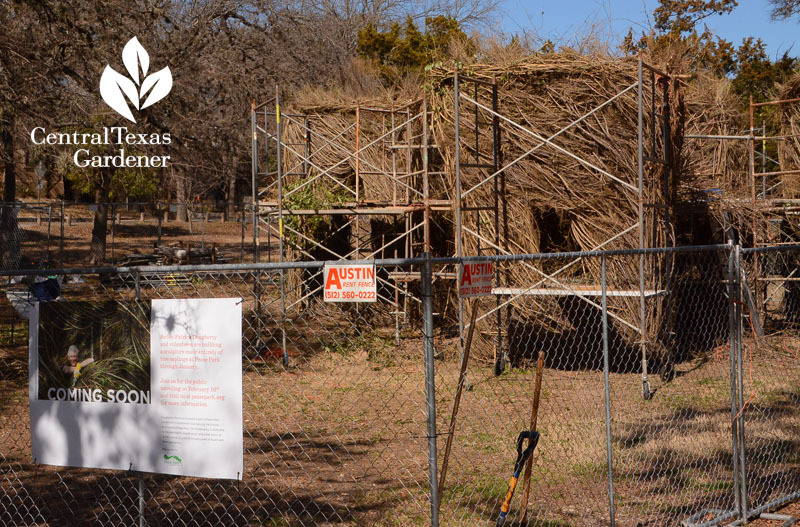 On Tuesday, the CTG crew headed to Custer’s Meadow in Pease Park for Stickwork artist Patrick Dougherty’s story about his distinctive designs woven from invasive plant removals. 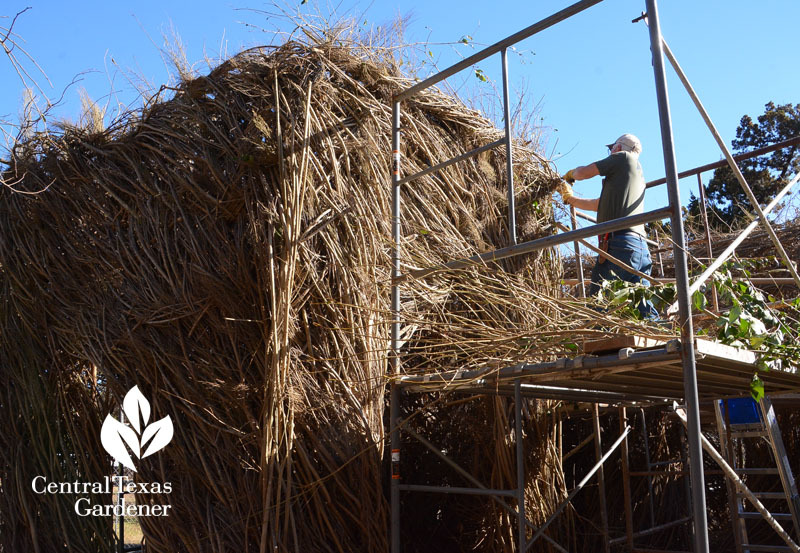 To celebrate the Peace Park Conservancy’s 10th anniversary to restore this historic and very beloved park, they commissioned Patrick to create an interactive artwork with invasives cut down by volunteers and cleverly woven together. Already it’s attracted lots of attention! Opening day coming soon and our video later this year. I’ve got a few “stick sculptures” in my garden right now. Once I’ve cleaned up dormant perennials, family-minded birds will busily craft their own intricate sculptures to replace last year’s wind-bedraggled homes. Until native zexmenia (Wedelia acapulcensis var. 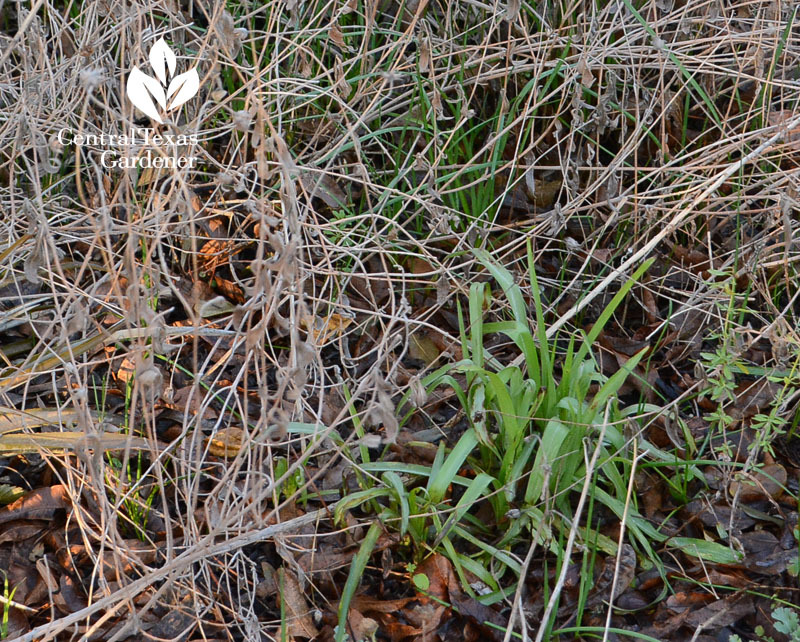 hispida) rebirths after its annual haircut, native spiderwort (Tradescantia gigantea) claims the green glory. My vast collection, starting from a few strays we collected, has diminished in recent years. 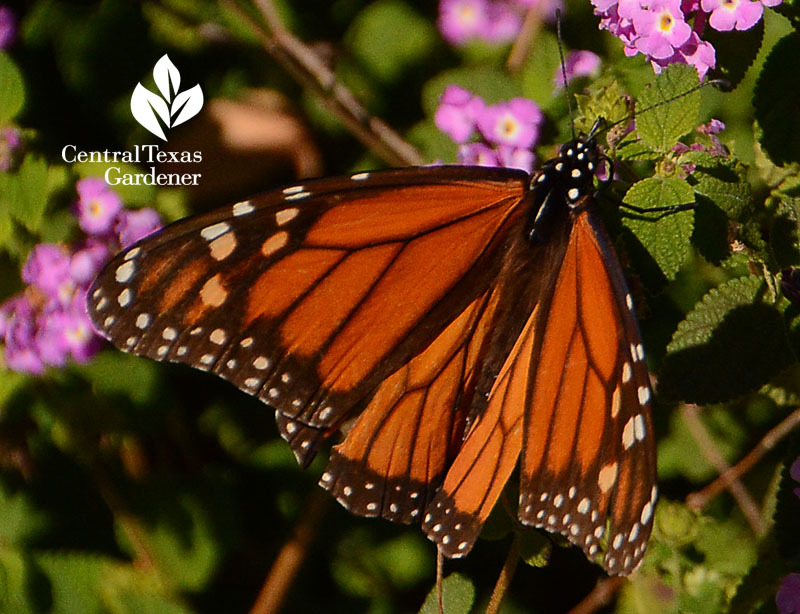 Although they naturalize via roots, I’ll collect seeds this year to ensure future February – April flowers for bees and butterflies. 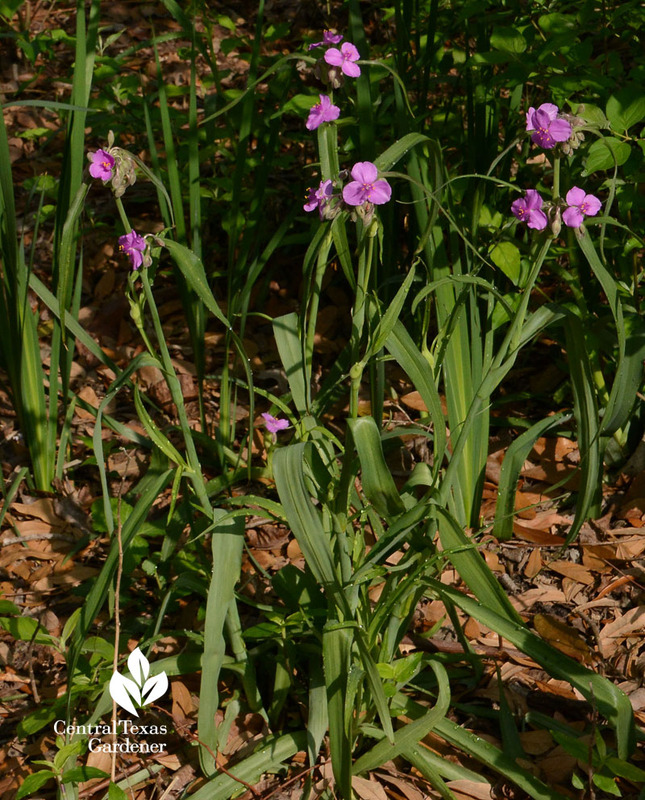 Find out more about this spiderwort as Daphne’s Plant of the Week. No reason to wait around about those crape myrtles, though! 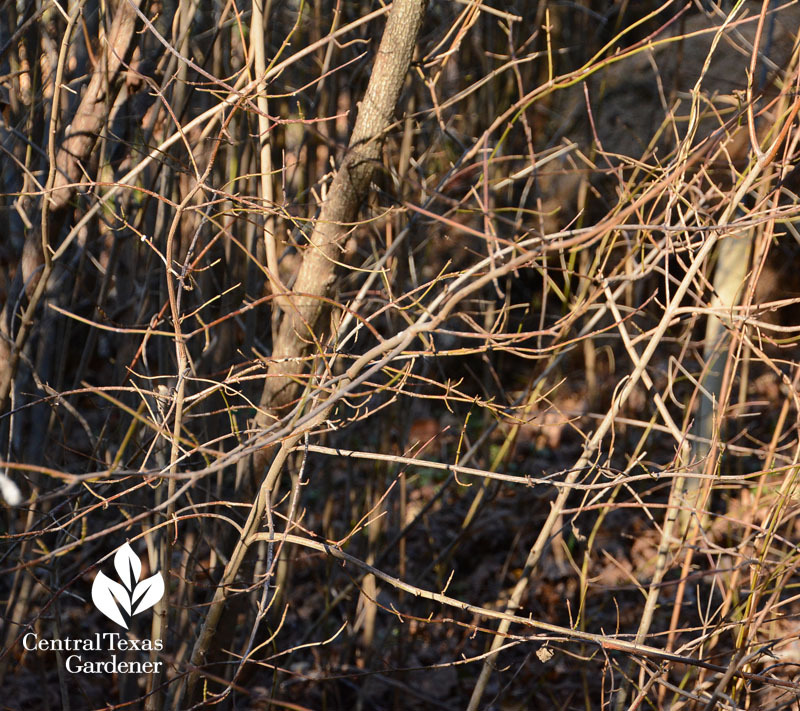 Now’s the best time to clip off little twigs and wayward, crowded branches for pretty form and lots of spring flowers. 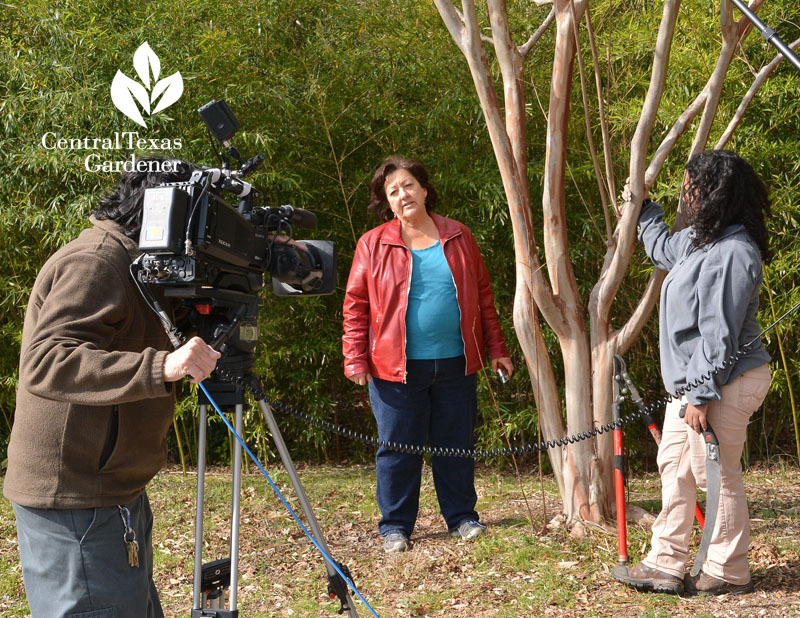 Trisha demonstrates how to do it and avoid the ugly tree syndrome. 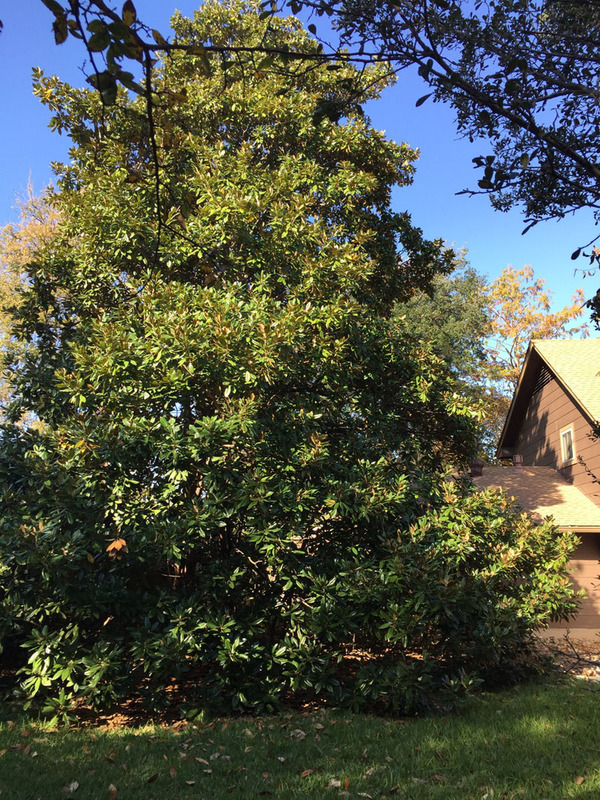 Like many trees and shrubs, including live oak trees, crape myrtles “thicket” or sucker. Trisha shows how to clip them down. My yaupon holly and rusty blackhaw viburnum are famous for this, too. I know some people dig up viburnum suckers to replant elsewhere: mine defy me! Sherry Mason’s got the same thing going on with her Southern magnolia; lots of suckers crowding the bottom of the tree. Daphne’s got your answer about trees that thicket. 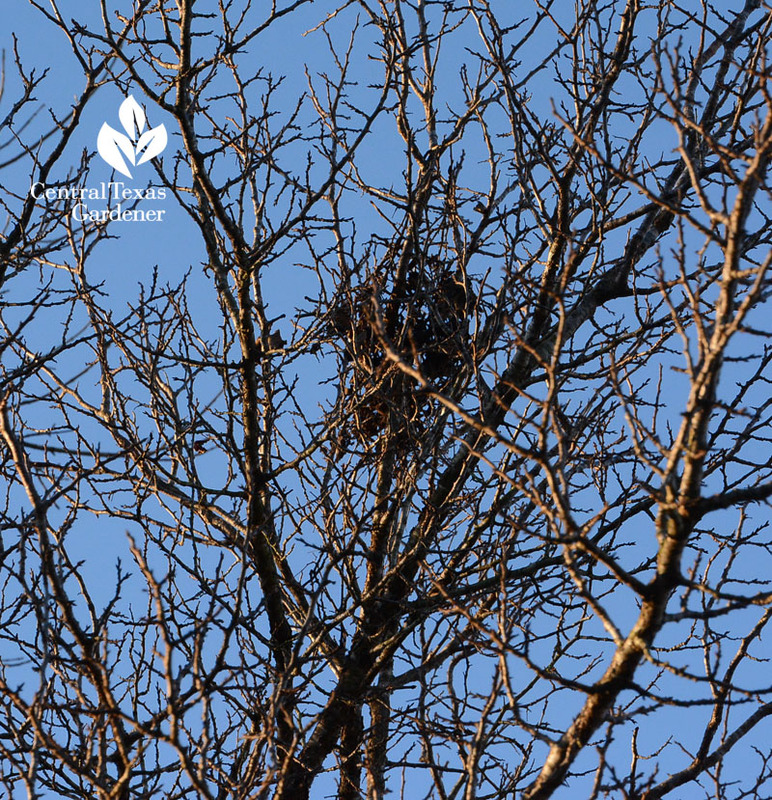 Note: do NOT cut oak wilt susceptible tree suckers from February – June if oak wilt’s in your area. AND: do NOT apply herbicide, since suckers are connected to the parent tree. Now’s also a good time to get your soil tested for its nutrient numbers. 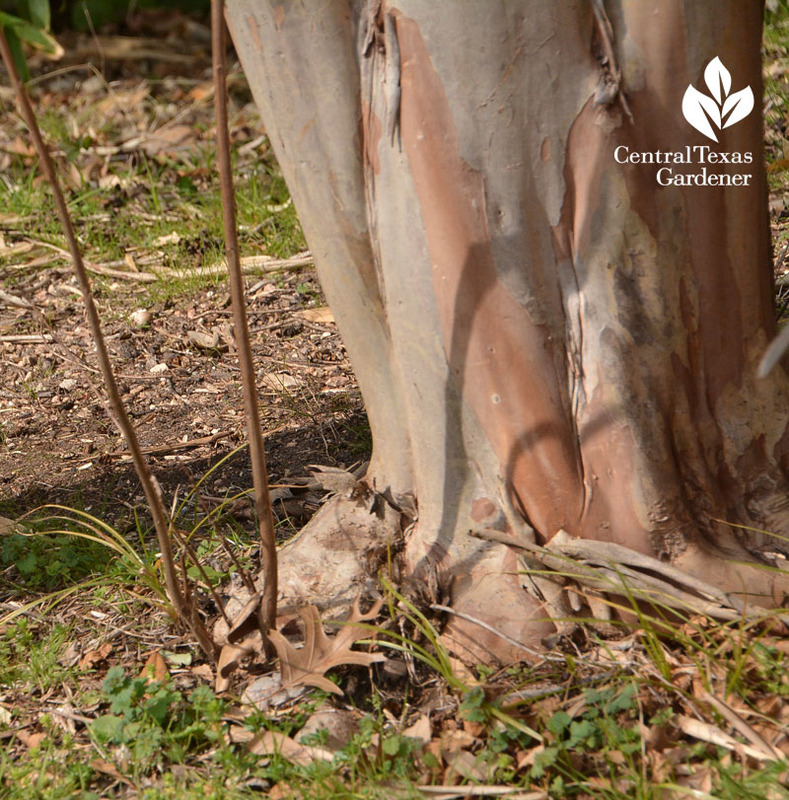 Our soil also naturally contains many elements that help plants grow. Other elements, like lead, arsenic, and cadmium can be harmful in certain edible plants. 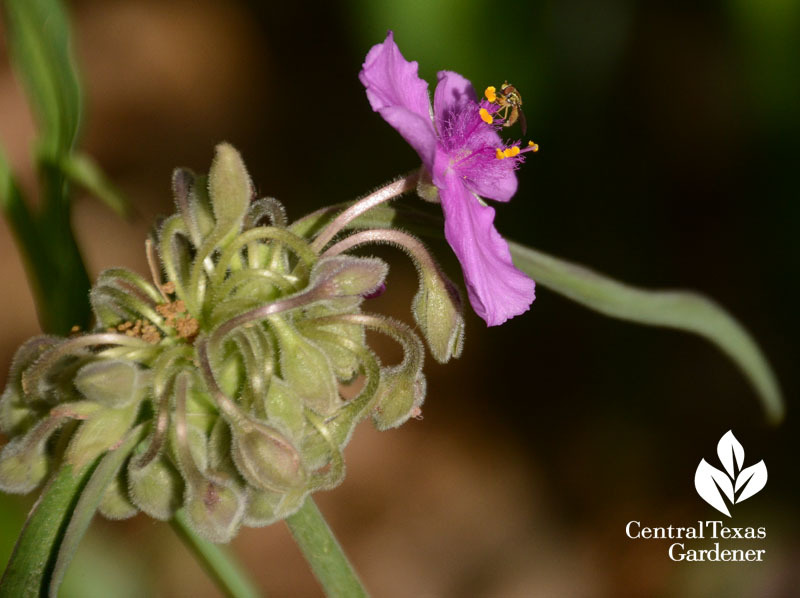 It doesn’t affect all of them and doesn’t impact flowers for pollinators. My garden, for example, was most likely once a farm where arsenic could have been used to repel insects. Peeling lead paint isn’t just an issue indoors; it remains in the soil. 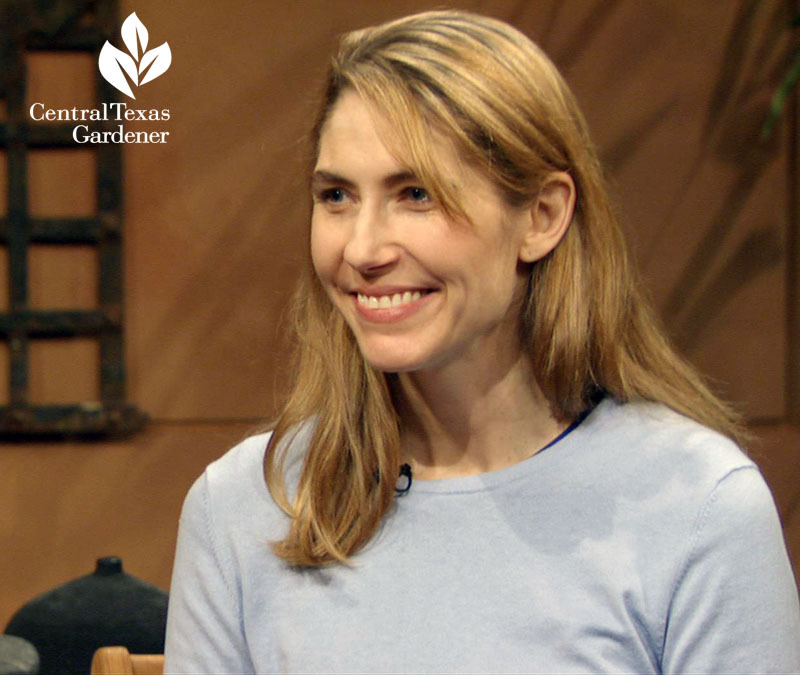 This week, Christine Whitney, City of Austin Brownfields Program Manager, joins Tom to explain why soils can be contaminated and what to do about it. 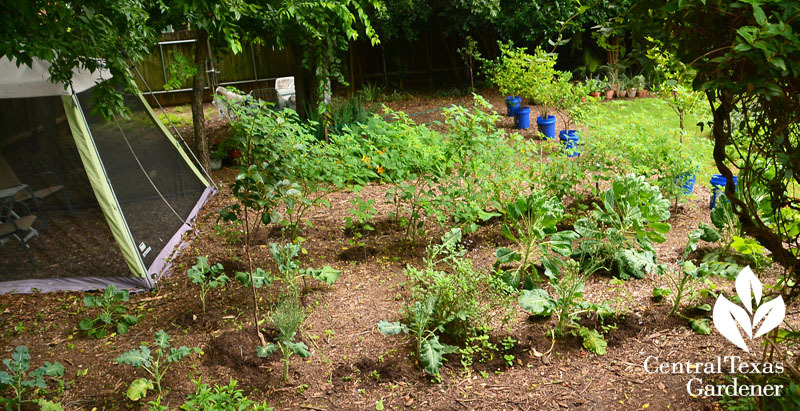 One thing is to remove the soil for edible gardens or grow in raised beds. 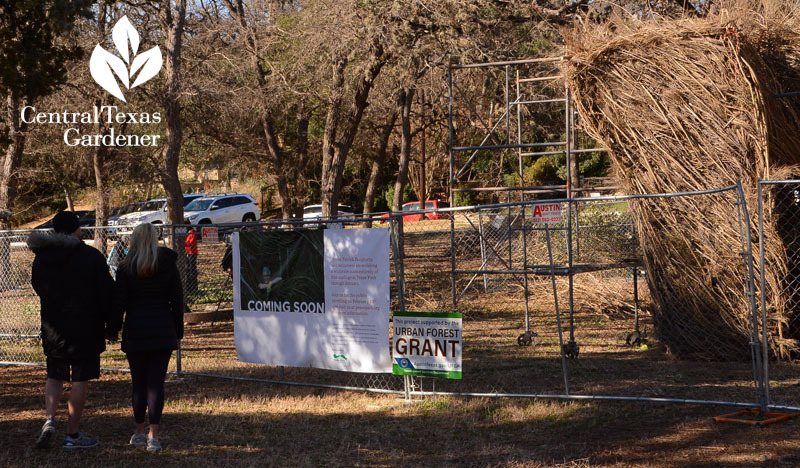 Find out more about Austin’s Brownfield’s programs. 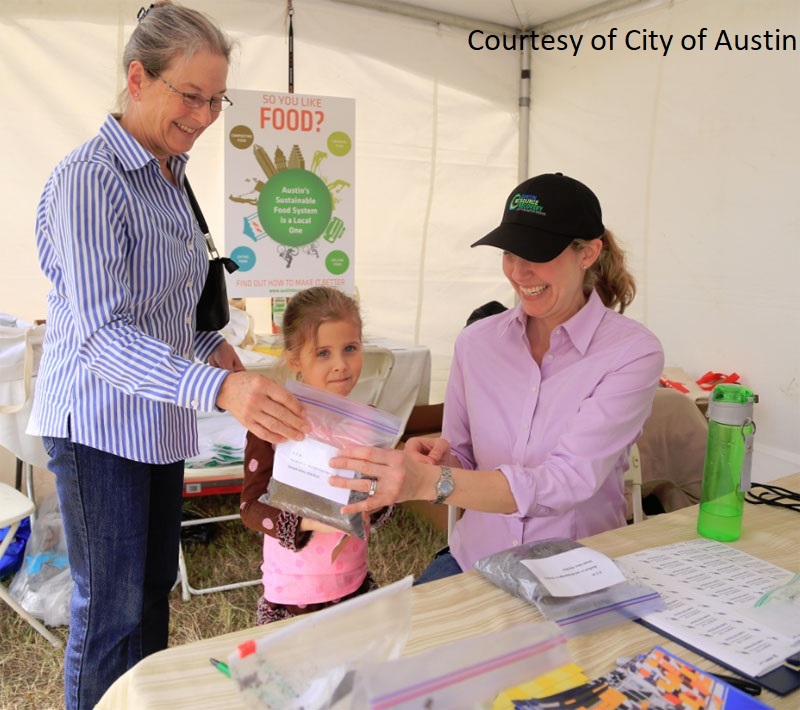 City of Austin utility customers can get a free soil test for nutrients and heavy metals at the East Austin Garden Fair on April 14 & 15. 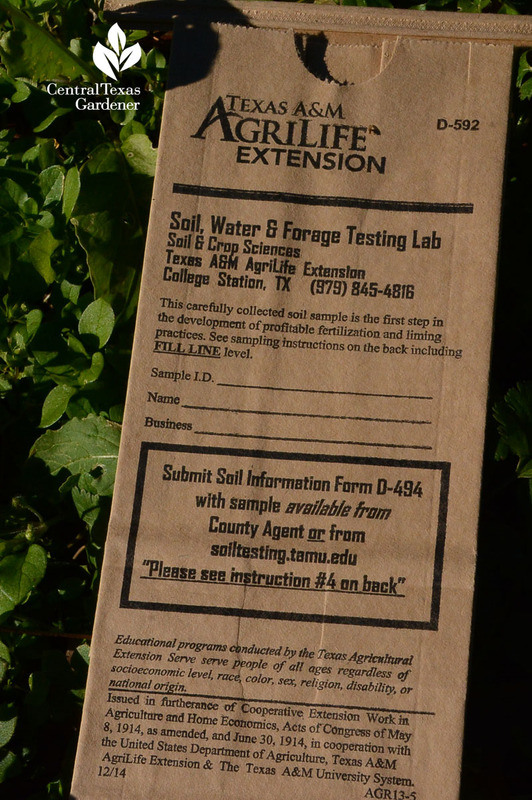 Outside of Austin, check out TPS Lab for every soil test under the sun (or ground), including heavy metals, compost, organic testing and more. 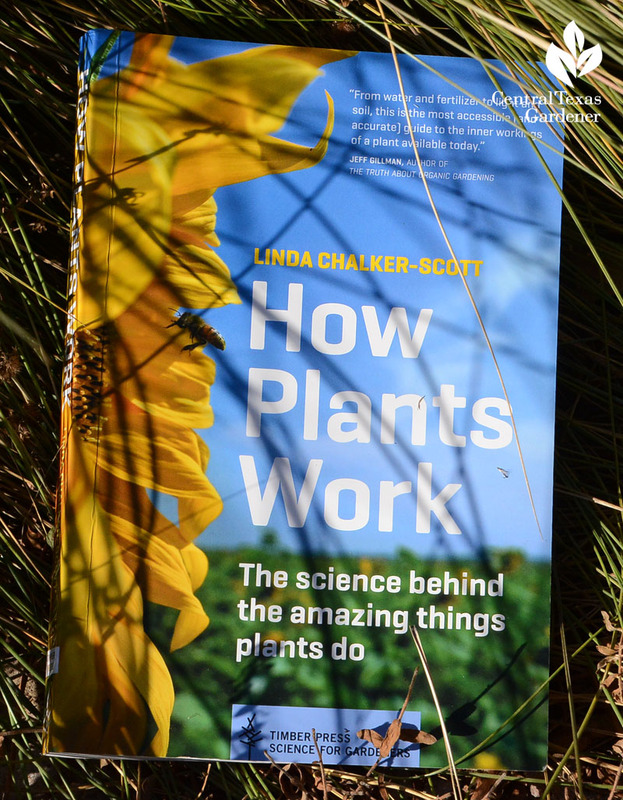 To get a solid grip on what’s going on with plants—including nutrients and heavy metals—check out How Plants Work by Linda Chalker-Scott, Associate Professor and Extension Horticulturist at Washington State University. 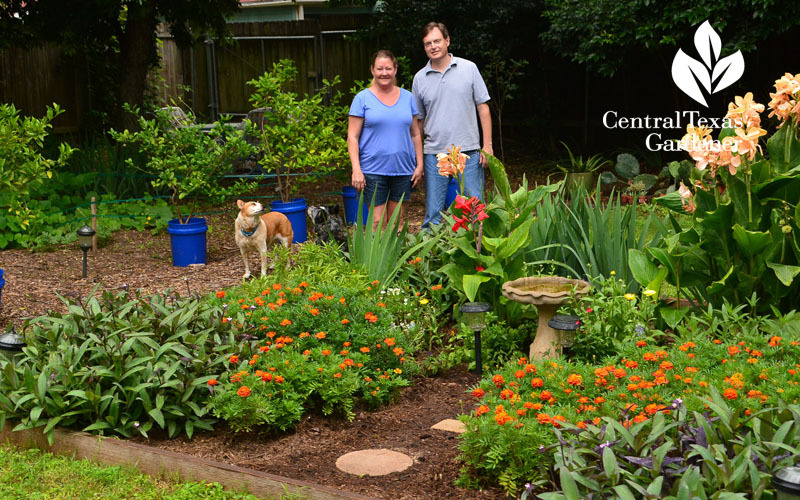 On tour in a standard backyard, Don Iden and Jana Beckham cultivate over 100 species of food, flowers, herbs, and succulents, many grown from seed or divisions. 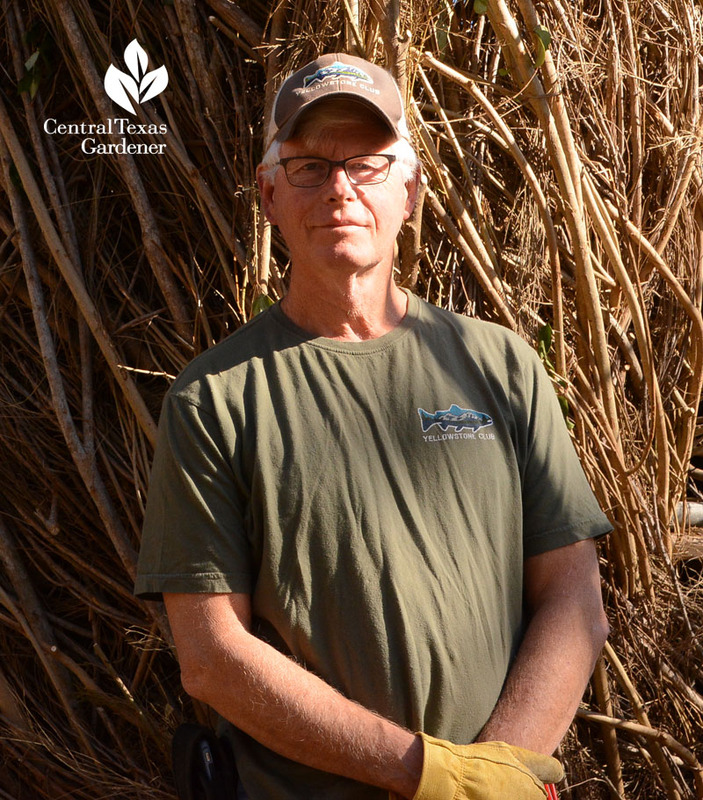 Since planting seasons intersect in Central Texas, they install future crops while getting the last harvests from the current crowd, rotating locations every few years. 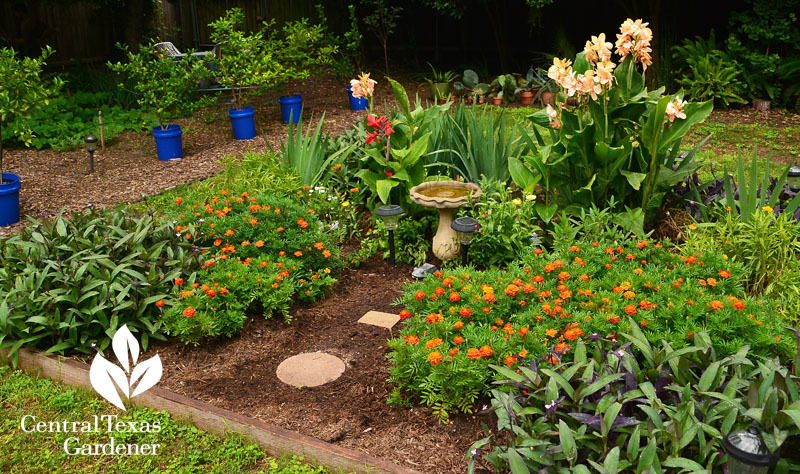 Don also grows tangerines, oranges, lemons, limes and even a pomelo. He raised a variety of miniature fruit trees from seed, growing them in buckets that are easy to move to warm quarters in winter. 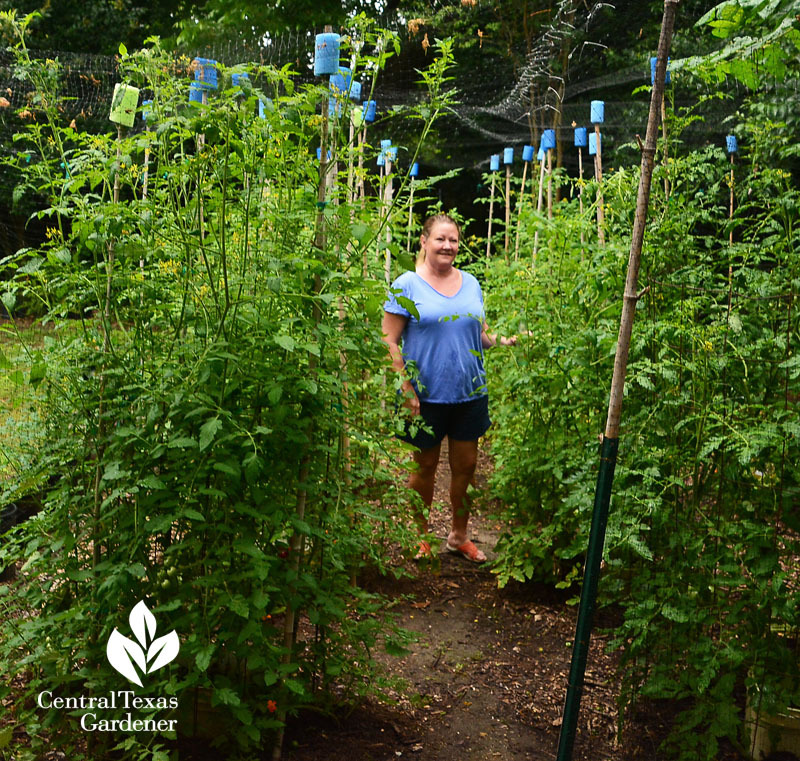 Jana built the central island’s frame for a color wheel of plants for pollinators. 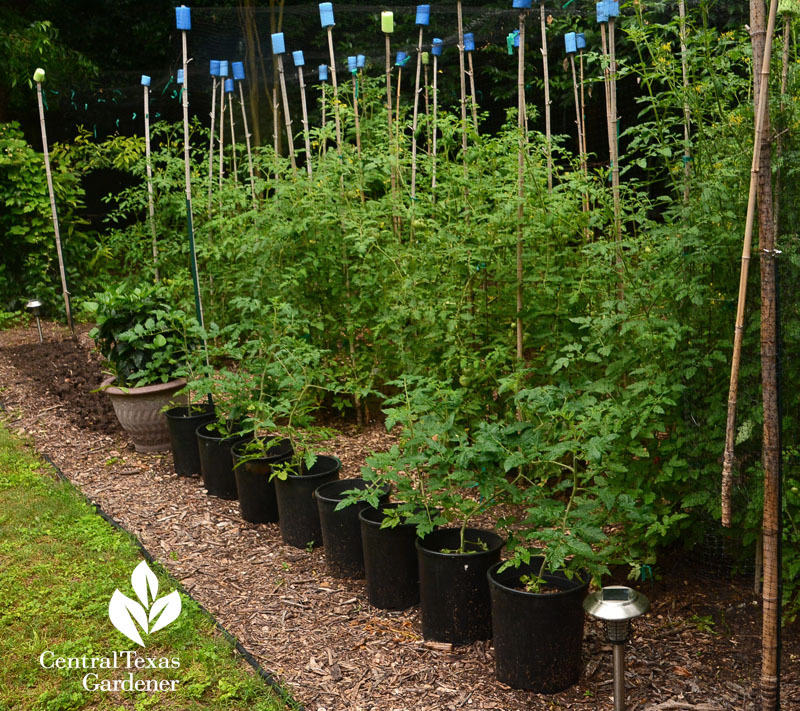 Their vigorous tomato crop, including heirlooms, begins in winter by starting last year’s collected seeds indoors, usually in January. Since window light isn’t enough, they install a grow light. A heat mat underneath the seed flats speeds germination. Last year, they added ‘Patio’ tomato. “It’s a smaller bushy form and ideal for pots. We like to maximize the space that we have,” Jana says. 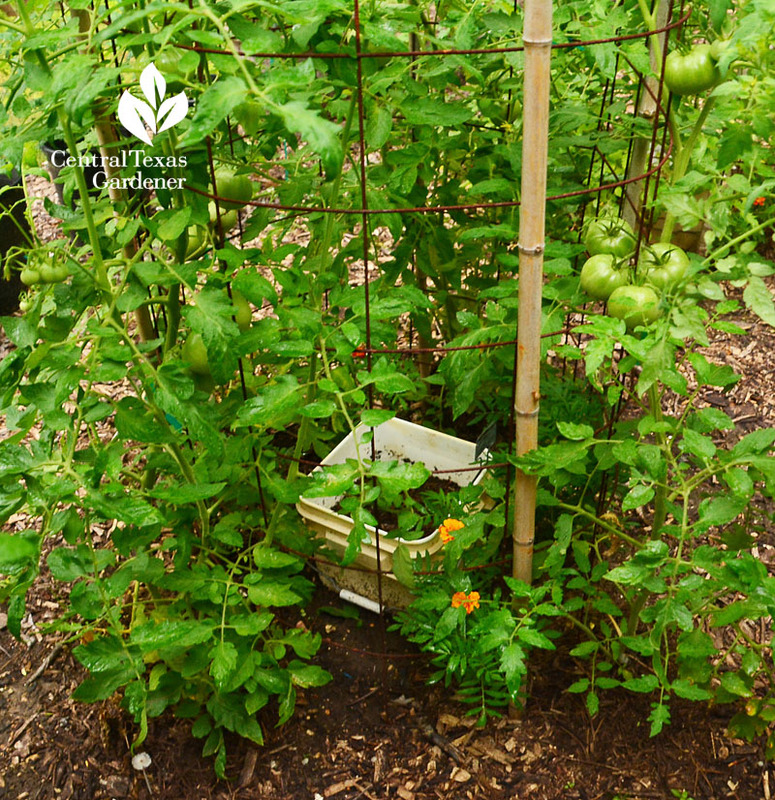 To anchor larger tomatoes, Jana drilled holes in the ground for bamboo stakes to stabilize typical tomato cages. She also drilled holes into the sides of recycled buckets and fills them with homemade compost. Watering directly into the buckets nourishes with each drench. 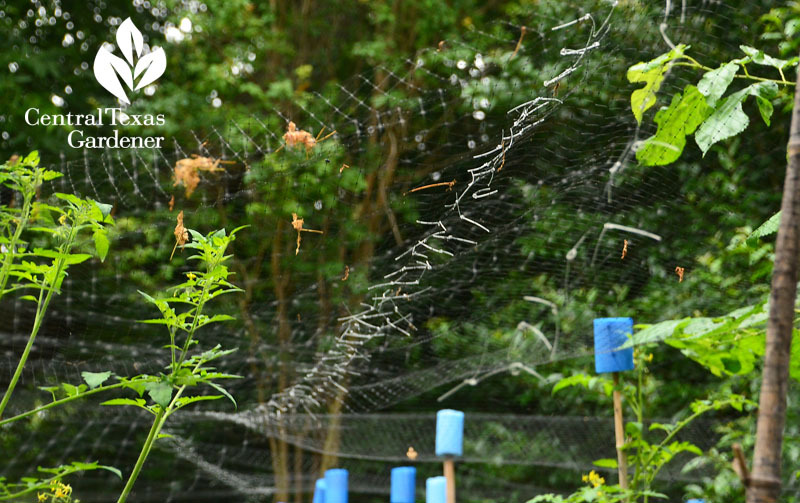 She stretches bird netting over the bamboo, weaving together the seams with fishing twine. Slices of pool noodles prevent tearing. So far, her technique has deterred birds and even squirrels. Lots more tips from Don and Jana, so watch now!